While audiences in China already deeply familiar with superhero stories taking place in famous cities like New York and even in outer space, Warner Bros is trying to catch moviegoers' attention by taking its DC Extended Universe (DCEU) to a new location: under the sea. Starting with Wonder Woman, the DCEU began exploring Greek myth with gods such as Zeus and Aries. Now, with the upcoming film Aquaman - which is scheduled to hit theaters in the Chinese mainland on December 7, two weeks before the US - it is looking to wow audiences with a hero inspired by the Greek god Poseidon. 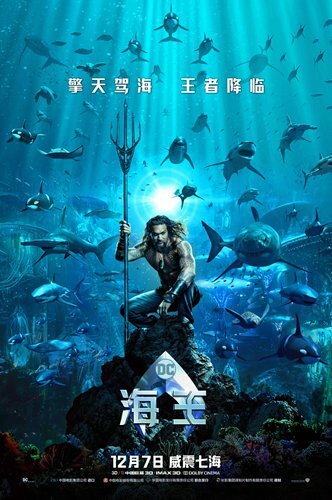 After the Chinese poster for the film was released on November 16, the level of anticipation among DC Comic fans in China shot through the roof. "Anticipating the most exciting movie in December," netizen Lixinlingluckygirl posted on Sina Weibo along with a picture of the poster on Sunday. Even famous Chinese actor Yuan Hong got in on the fun, joking about Aquaman lead actor Jason Momoa's role on the popular show Game of Thrones, in which Momoa played Khal Drogo, the horse lord. "I am really excited about the trailer for Aquaman. I can't believe that the horse lord has now become the lord of the ocean!" Yuan posted on Sina Weibo. Momoa plays Arthur Curry, a young boy born to a human father and an Atlantean mother, who was also queen of Atlantis. With his great power and royal heritage, Arthur is asked to become the king of Atlantis in order to protect the underwater kingdom and its people. An Australian-born Chinese, director James Wan is a well-known name in China as he directed the seventh entry in The Fast and the Furious series of movies - a franchise that is incredibly popular in the country. He is also known for horror movies such as Saw and Death Sentence. At a media event in Beijing on November 18, Wan expressed that he was very proud to be "going home" with his newest work. "I am of Chinese heritage," Wan said. "This is my first time to China and I am super excited to be here." Knowing Aquaman's connections to Greek myth, some Chinese fans have wondered if one day Chinese mythology could also inspire Wan to create a film. Wan did not disappoint with his answer. "I grew up with a lot of Chinese stories, as well as movies," he noted. "Journey to the West is my favorite. The Monkey King is a fantastic character and the philosophy behind this role is exciting. It is definitely something I will be very excited to potentially tackle one day." As the title of the film indicates, Aquaman takes place largely underwater. To make the world as realistic as possible, Wan focused a lot of effort on visual effects, with many scenes shot entirely on green screens in order to bring the imaginative world under the sea to life. The undersea world isn't just a big blue expanse either, just like the surface world it has different environments such as "jungles," "skyscrapers," and some ancient Rome relics and even an upside-down sunken ship. Sea creatures can be seen wearing fancy and exquisitely detailed clothing just as humans do. According to Wan, the sea world is based on the real world but with a fantasy twist. "It is a new world you have never seen," Wan noted, adding that this freedom to use their imaginations to the fullest made making the film fun and challenging for the entire crew. Another challenging aspect were the action and fight scenes, which required the actors to complete several "Mission Impossible" stunts. "The biggest challenge for me was to not get hurt," Momoa joked at the event, but also noted that the film has far more special effects than any other work he has worked on. Amber Heard - who plays Mera, a protégé of Arthur's mother Queen Atlanna - mentioned that she learned a lot of Chinese martial art moves for the action scenes in the film. Visual effects, however, can leave a film feeling shallow if there are no characters for the audience to root for. To this end, the film looks to explore a different side of its hero that other DCEU films have yet to explore: his softer side. According to Momoa, who has mainly played tough warrior characters on screen, this made the role something special for him. "I think the other roles were harder than Arthur, but I think Arthur… his character is fairly close to who I am," Momoa told the Global Times. "You can see the superhero break down and show his heart… and fall in love like a puppy," he joked.